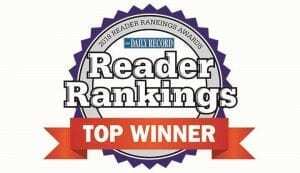 Edwards Performance Solutions was honored to be included in The Daily Record’s 2018 Reader Rankings awards – a recognition for outstanding Maryland companies. Edwards was not only selected as a Best Cybersecurity Company, but also took home the Top Winner spot at the award ceremony on July 26. Awardees were nominated by The Daily Record’s readers and determined by over 12,600 votes. More than 145 winners in over 45 categories were recognized as Maryland’s best in a variety of categories. In addition to Edwards’ cybersecurity solutions, we are also heavily involved in furthering local cyber initiatives with The Cybersecurity Association of Maryland, Inc. (CAMI) and community Tech Councils. Thank you for your votes and commitment to extending our name as an excellent cybersecurity provider! To view the full list of awardees, please visit The Daily Record website.